The American Revolution was fought during the late 18th century when the colonies tried to gain independence from Great Britain. The Boston Massacre occurred in 1770 and was the initial blow in the Revolutionary War. During this particular skirmish five colonists lost their lives and word of it spread quickly south to the rest of the original thirteen colonies, enraging all Americans. 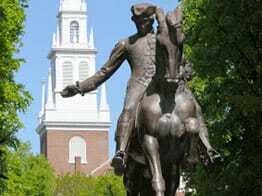 Five years later Paul Revere jumped on his horse to warn others of the coming British Redcoats. All that and more in Boston. Aside from the Boston Tea Party, Bean Town is also famous for producing the revolutionary hero Samuel Adams, Presidents John Adams and John Kennedy. Henry David Thoreau spent a couple of years living in the woods near Walden Pond and thought everyone else should do the same. Ralph Waldo Emerson existentially rooted him on. Thoreau’s message of peaceful civil disobedience was later also embraced by Martin Luther King Jr. and Ghandi. Harvard University is in Cambridge and happens to be America’s oldest university. Another great school is Boston College. M.I.T. is another. In fact, during the school year it is estimated that one third of Boston’s population are college students, or about 200,000. Do you think those young people are using auto transport carriers in a big way? You bet. Like so much of the eastern seaboard, I-95 runs north-south through eastern Massachusetts and Boston in particular. Cape Cod utilizes state highways to get in and out, but greater Boston is encircled by I-495 and it leads also to the Cape. Interstates I-90 and I-93 begin in Boston and head west and north respectively. In the western part of Massachusetts, I-91 runs north-south through Springfield. All of those freeways make shipping a vehicle a whole lot easier. The problem areas for auto shippers are Cape Cod because it’s a dead end and longer than you think, and also northwestern Massachusetts where the country roads are beautiful but tough on car haulers. Basically, if you’re shipping a car to the Boston area your chances are pretty good that it will happen fast. Unless your automobile is in the Boston financial district or Cambridge, where traffic seems to crawl, auto shipments tend to go smoothly. If you are headed to the Boston area or to any other city in The Bay State, our Massachusetts car transport service can really help. If you have questions about auto shipping, feel free to contact us by dialing our toll free number at 800-600-3750. You can also visit Direct Express Auto Transport to fill out a simple form and get a free car shipping quote. We make it easy to book your vehicle shipment online.